Feathers are made out of the same stuff as fingernails which is a protein-like substance called Keratin. It is the toughest of animal materials. However, pests and mold and sun can still destroy feathers. But as long as you take these simple steps, your feathers should last forever, barring a chew-happy puppy or some other accident. Freeze. When you first get your feathers, keep them isolated from any other plumes. Put them directly into a freezer that is set at zero degrees Farenheight or -18 Celsius (colder is even better). Leave them in for at least 48 hours. Take them out for a day and then put them back in for another 48 hours. This will kill bugs. Instead, you could soak the feathers for a half-hour in a mixture of half isopropyl alcohol and hydrogen peroxide, but I find freezing is easier. 2. Clean. Wash with a mild soap like dish soap. Gently rub off any dirt by moving your fingers from the base toward the tip of the feather, like petting a cat, who likes its fur rubbed the right way. Rinse with clean water. Air dry or dry with a hair drier. If the feather is misshapen but intact, you can try putting the feather in the steam of a tea kettle and gently preening it back into perfect shape. Youtube will have a few videos about this steaming method. 3. Store. One cleaned, keeping the feathers dry and sealed is the best protection against future problems like mold and insects. I usually seal my feathers in plastic bags. That is about it. If you ever notice tiny holes or loose fluff about your feathers, isolate those from others and go through the freezing process again. An extra precaution that you may choose, but it involves chemicals, is to place a smal dusting of flea powder in your container. This is the same stuff that is sometimes put on dogs and cats (active ingredient is Carbaryl) . This will kill mites and beetles. Sometimes feathers are stored with moth balls (naptha or paradichlorobenzene) to repel bugs but this is smelly and more toxic. People used to store feathers (and woolens) in cedar chests because the wood oils can repel insects. I don’t have a cedar chest but if I did, it wouldn’t hurt to store them this way although I would still keep the feathers sealed. A quick video tour of the show. I am living for a month as the artist in residence, in the middle of Suguaro National Park. Morning hikes and talking to the plant, bird, and animal biologists pushes me to learn a lot about the desert in a short time. Yesterday’s education was about how spiny most of the plants are. I have little red pricks all up and down my legs after a close encounter with what is not aptly-named Teddy Bear cholla cactus. Being an artist is not all about pursuing pure creative ideas. For instance, each finished piece has to be transported from one place to another. It’s a lot of work and a fair expense. A bay in my barn is full of empty cardboard boxes that my frames come in, special, studio-built art shipping boxes, and commercial art shipping boxes. It is kind of a mess in need of cleaning and organization because I haven’t gotten to it as I am usually making art. Fortunately, my assistant Grant is up to the task. I usually work in my studio after breakfast. The sun is finally shining so today I put down my tools and step outside. Watching and listening to the birds, touching and smelling the recently wet earth, I think, what if my creations and busyness are nothing and this is everything. I am not sure why I am continuing with a fascination for birds enclosed in circles. Maybe I empathize with caged creatures like the rooster that crows every morning, vital with life. Or, perhaps a bird enclosed in a circle reminds me of how I am surrounded, limited but protected by the environment around me. Or it may be that I see circles as pleasing forms, complete. I hear from writers that they often find it helpful to let their writing sit for an hour, a day, or more. When they come back, they hope to see it afresh. Often they quickly realize what needs improvement and how to fix it. I do the same with this blog. I also do it with my art. I struggled toward placing the 15 cutout cranes in this piece but was not satisfied. After three days I tried again. A few days later after a third try I was pleased. The process is pleasing also. Sort of a discipline. I have to let go getting immediate results, delaying my gratification over completing each piece. The result is always better. The many colors in this feather are created from the protein-like substance melanin; the same chemical that colors human skin. Many families of birds, like ducks and pheasants create feather color using melanin. Their bodies do not have the ability to create the bright yellows and reds in the feathers that you see in parrots and some songbirds. Feather color is a complex subject so the previous paragraph is a simplification partly to fit this blog and partly because I don’t know the full story. If you have additional or contradictory information and sources about these feather colors, I will add it to the blog. This time of year, the light fades as dark takes over in my northern quarter of the world. This piece has taken on a fantasy feel as I am less active outside now, dreaming of birds and imagining what the birds may be dreaming. I keep a composition book close to me. In it I scribble images of ideas for potential future pieces. The scribbles are kind of like a shopping list kept on the refrigerator to add to as the needs arise. They remind me of what I was thinking. It is all I need see in order to move forward with a piece. Busy bushtits flock near my house with a tendency to occasionally squeeze together for a few seconds on a branch like fluffy ping-pong balls. Then they disperse, looking for tiny foods. These birds also squeeze together into hanging nests to hatch eggs and raise the babies until they are ready to fly. 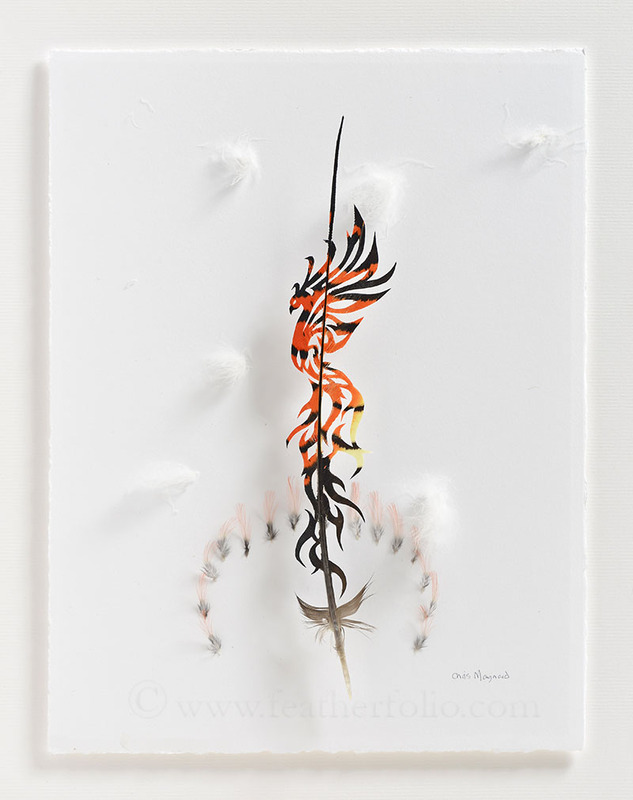 I want to respect the essence of each individual feather form in my art. That means I don’t trim the feathers or flatten them to a background. 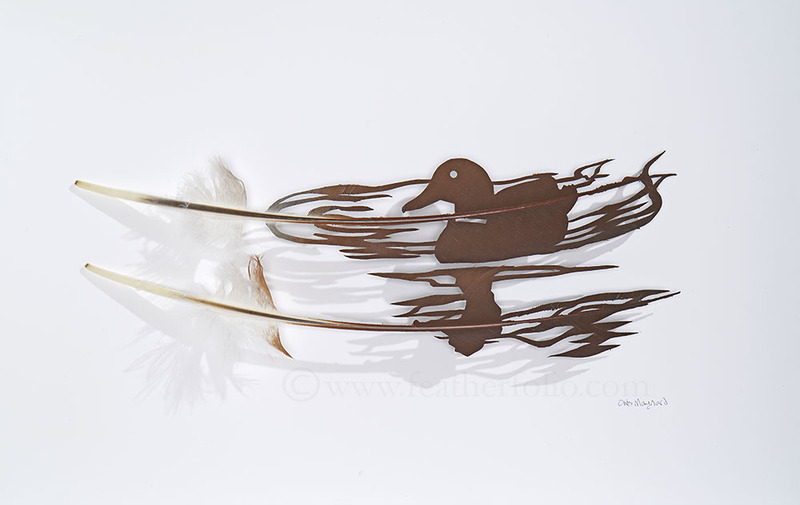 All my work is with single feathers, usually divorced from a feather’s overlapping arrangements on the bird. Two prominent artist do trim their feathers but seem to visually respect their overlapping aspect. One person is Patrick Scott (Navaho) whose fans can visually honor the overlapping tail arrangement of the birds whose feathers he uses. Another artist is Kate McGwire (from the UK) whose overlapping abstract feather sculptures still can be reminiscent of the nature of way feathers cover birds’ bodies. Autumn in the woods, all movement is downward except for birds in flight. The big leafed maples shed their huge leaves which float to the earth, softly crashing through other branches and bushes. The deer hardly seem to notice. But for any quick upward movement, their heads jerk up, ears forward, nostrils quivering. In mid September, I was one of five judges to select next year’s federal duck stamp. Every waterfowl hunter in the USA has to purchase a license and stamp in order to hunt. Purchasing the stamp raises money to reserve lands in conservation. It is how much of the nation’s wildlife refuges were purchased. Each year the US Fish and Wildlife Service sponsors the only federal art contest to choose the image for the next year’s stamp. More information about the program is here. For the artist chosen, it can be a career-maker. The five judges included me, another artist, Brett Smith, an art educator, a biologist, and an award-winning conservationist. See all the entries here to know that we had a tough job deciding. In my previous my blog two weeks ago, I was trying to resolve how to incorporate a round raven construct into something to bring the abstract more into the real. Here is my result. Something that makes it more real for me are the feathers incorporated into the paper background. 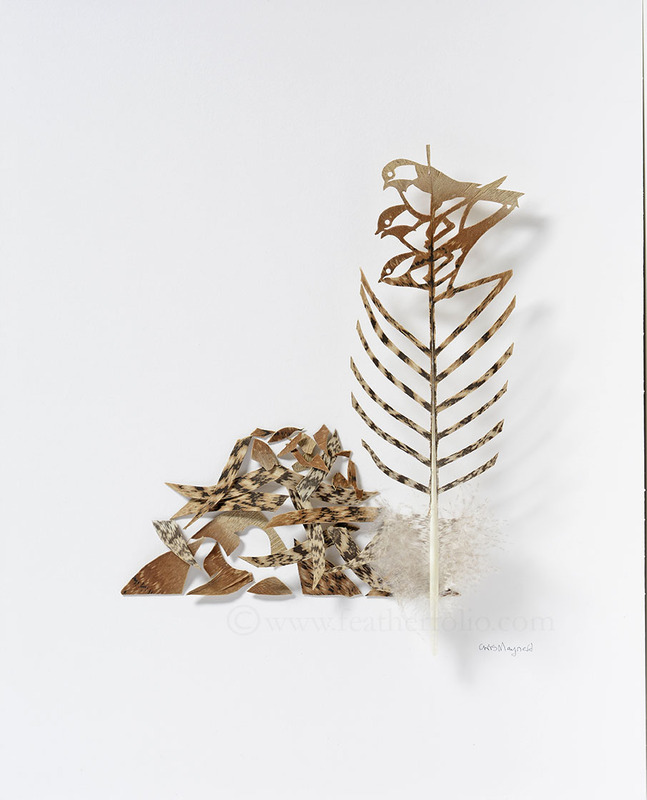 In her small studio in Maine, Virginia Sarsfield makes paper from the feathers from my geese that I send her. 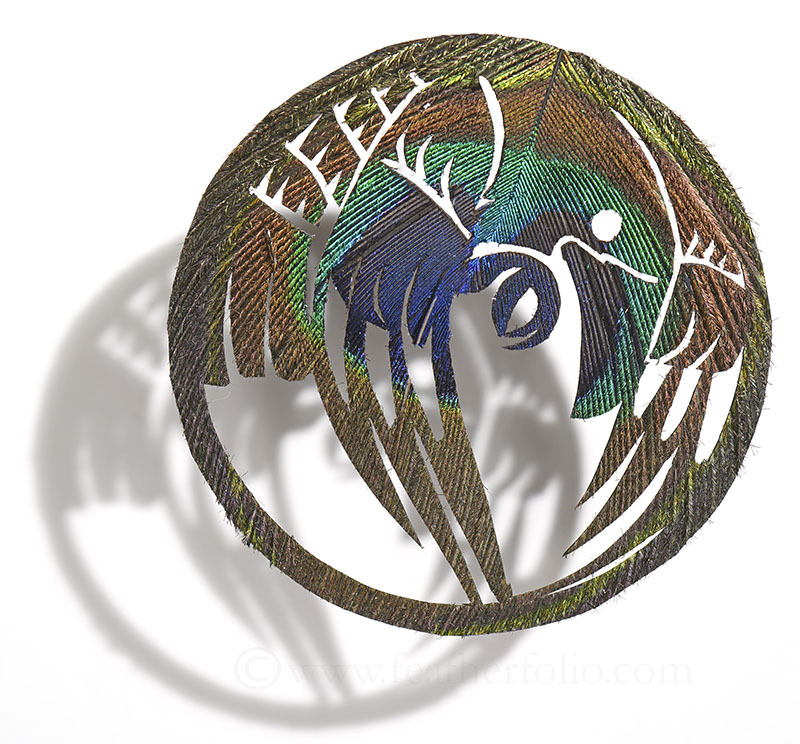 This cut peacock feather is a bit abstract, a little more divorced from my real experience with the birds themselves. I enjoy making these kinds of designs but find it is difficult to incorporate them into larger pieces where I want the inspiration to arise more from my knowledge of, experience with, and respect for the birds themselves. The work of mine that I like the best tends to be simple silhouettes of birds in motion. So I am still trying to figure out how to incorporate this design into a larger piece. Since I am surrounded by barn swallows, they are my main bird-inspired themes in the summer. Like stars, they have five points: the head, two wings, and two tails. Hence the inspiration for this piece. The 50+ swallows that nest in my barn have a problem: the local kestrel falcon has discovered their nestlings and flies in every day to try to eat them. The swallows protest and I come out from my studio. When the little falcon sees me, it flies away. I ask myself if it is best just to let this natural process proceed. My answer is that I am vested in watching these swallows breeding and want them to return every year. So I lightly intercede, chasing the kestrel off. It flies away to look for mice in the fields. The natural red of this female red-tail black cockatoo tail feather seemed a good choice to kind of mimic the cinnamon-red of the kestrel’s tail. I often think of feathers as being about flight. People who work with feathers primarily in fashion often view feathers as being about beauty. Certainly, they are about both and much more. I have noticed is that the most talented of these few people also show respect for the birds that provide them with their working materials, feathers.